where i rest my head. It was a happy moment like no other. Little had even been formed yet, but that did not stop the warm rush of emotions for the divine being. There she was, draped in a beautiful garment that was colored in a rush of flowers, as if an everlasting garden had decorated the kimono itself. It seemed to have been weaved from the finest strands of silk, and the obi belt and neatly tied ribbon to match complimented her lovely style of dress. It was not something she had picked, her clothing, but somehow it had come into being along with her own essence. Her gown, a pinkish rosy purple in color, which represented some kind of keen and rare royalty, could only reflect her newly created soul, which was only as old as her first heartbeats to pass, and seemed to be as fragile as the morning dew. Her skin was pure white, like delicate porcelain china, and soft and unblemished and unmarked. Her hair was black like shiny obsidian, volcanic glass that had yet to exist; yet somehow, she could just feel it and quietly mouth the words as if one day, such a thing would come into existence. The frame of her body appeared delicate and dainty, all while carrying an odd youthful strength underneath her snow-white skin. The features of her face were perfect in proportion to one another, as she had rosy lips, a sturdy chin, dark and thin eyebrows, and long, black eyelashes right above her deep-hued eyes. Her eyes were a light shaded and bright color of pink, and while she could not see them for herself, lacking any sort of mirror to view her reflection, something about them heralded that she would be the only one to ever possess such a unique color of orbs. Nothing in the future would ever come into being by means of natural ways with such a color in their eyes. Instead, natural colors would echo that of which had to come next into existence, in regards to appearance: the leaves of trees and the blades of grass, the bark of great trunks and the rich soils and sands of the earth, and the brilliance of the skies and the winds. But never would the color of eyes match the tint of Izanami’s own eyes. Izanami. That was the name she had been given, as she just heard it resound in her head before it continued to echo throughout her existence and reality, the past few seconds, the present in which she breathed, and the future that had yet to come. 伊弉冉尊, they called her, again and again. Izanaminomikoto, or to pace the meaning in her head, Izanami no Mikoto. The meaning she could give the strange words seemed pleasant, and filled her with further happiness. “She Who Invites”. Did she invite? The woman certainly hoped that she could, hearing the words that were her name reverberate to her even from the future. She would invite, but while she understood the significance and value to the words, what did it truly mean when one broke it all down further? She had yet to discover so much, but it was already quite overwhelming for the young divine being. She could only look to the ones who had created her existence there in the first place. The first gods, Kunitokotachi and Amenominakanushi, who had been the ones to summon them into being. Them? Pink eyes trailed up from her colorful kimono to peer at the figure standing next to her. He was beautiful, with long hair that was shaded in onyx-hued ivory black, while he had slightly off-white skin, more akin to olive than to her own fair snowy white. He was well toned with muscles that seemed to gentle ripple as they flowed with his strong movements. He was much taller than her, and wore a haori over his garment woven with the purest of pearl and opal pigmented silk, along with streams of deep red and shaded crimson to outline his obi. His name was given to him just as hers had been given and received by her. As he mouthed it in silence, Izanami somehow noticed it and breathed out the actual words first. Izanagi. He who invites. Together, they were would receive their first charge from the two gods who brought them into existence. And only together, would Izanagi and Izanami create the first lands. Their elder gods and creators would bestow upon them a gift- a spear decorated with the most dazzling of jewels. The gemstones were of many various hues, all almost being the first of their kind. What would later inspire amethyst, diamond, beryl and emerald, opal, sapphire, ruby, aquamarine, zircon, topaz, garnet, quartz, and more adorned the weapon that had been given to the two young deities, who were taking in their very first breaths of life. The spear was named Amenonuboko, the ‘heavenly jeweled spear’. Izanagi, the man dressed in a fine, silk, masculine kimono took the spear and held it tightly. They were summoned into existence in order to be charged with the creation of the land. The heavenly spear was anything but normal, and before too much time passed, the two new deities approached a place known as Ame no Ukihashi, the floating bridge of heaven. The ‘bridge’ was laced with clouds, which reflected the sun of the rich dawn. Taking the naginata, the gift from the elder gods, Izanagi struck the water and began to churn the seas. The oceans were stirred in vast proportions, and as he pulled the jeweled spear from the water, the salty droplets began to fall from the tip of the blade back into the ocean. Below the bridge, those drops of ocean water mystically began to form new land. Onogoroshima was what they named it, or Onokoro Island. It was the ‘self forming island’, and the place where the god and goddess of creation would descend from the bridge of heaven, and make their new home. Time passed, and the two grew close. Eventually, as the elders expected, the two wished to be married. After building a magnificent and magical palace, Yahiro Dono, a marriage ceremony was condoned and held at the pillar, Ame no Mihashira, the Pillar of Heaven. However, all did not go so smoothly, as Izanami was the first to speak, which broke tradition. Izanagi chose to ignore it, and the marriage ceremony was completed. After many months, two children were birthed, Hiruko, also known as Ebisu, and Awashima, but arrived in the heavens and earth deformed. Because of this, they were considered demons, not gods. It was the curse of breaking tradition during the marriage ceremony, with Izanami speaking first. The two held another marriage ceremony, going around the Pillar of Heaven once again, with Izanagi speaking first. After the tradition was mended, the two were blessed with many children; most notably the Ouyashima, the Great Islands: Awaji, Iyo, Ogi, Tsukushi, Iki, Tsushima, Sado, and Yamato. More children came along after the Ouyashima chain, however, and Izanami finally gave birth to Kagutsuchi, the incarnation of fire. Upon giving birth, the flames from Kagutsuchi were enough to burn and kill off the deity, while leaving her husband infuriated with his grief. Izanagi released his anger as the newborn incarnation of fire felt the full wrath from the god of creation. With his sword, Abe no Ohabari, he beheaded Kagutsuchi. The blood to drip off of his blade, infused with the power of the late Izanami, created two children- Kuraokami, the god of rain and the weather, and the sea god Watatsumi. Delicate hands traced the words on the scroll, written in clear and fine calligraphy. All Kanji, nothing her young helper would be able to read. This was not for future lessons for her students, however. Fine, pursed lips smiled gracefully as her dim red eyes narrowed at the last sentence. Only two children from the blood of the incarnation of fire? She eyed the other scrolls resting next to the open one. The woman had extremely long hair, going well beyond her waist, that was pitch black in color, matching the hue of shiny, well polished, obsidian. She wore duller-hued garments, contrasting from what she typically fancied. A dark blood red kimono, with patterns of abstract and intricate designs. Lining the impressionist shapes were silver threads, faded and no longer shiny and metallic. The obi she wore was black in color, and the ribbon remained tied behind her as neatly as ever. More tales of the history of realm she roamed, volumes to follow after she finished the first one. Omitted from the records were the words of her own birth, which amused the refined Enenra. The final traces of smoke that Kagutsuchi gave off as he died remained in the world, powered by his divine heritage. He was a direct descendent of the deities of creation, Izanagi and Izanami, after all. The smoke eventually developed a will of its own, becoming self-aware, and refusing to dissipate into the atmosphere. When noticed by others, deities and mortals alike, the smoke was described to be like lightweight fabric. However, only those that were pure of heart could actually make out the form of the divinely-born smoke. The being began to be known among the rumors as ‘Enenra’, or 煙々羅. The Lightweight-Fabric Smoke. It was her own birth, and one that the historic record of the creation failed to acknowledge. Not that Kemuira minded too much. To her, it was merely an amusing idea to contemplate. Reading the chronicle scroll brought about another thought, however; about the young tanuki to have visited her recently. The only reason the Enenra Youkai had agreed to help was because of the debt she owed to Rika Riyoshi, a noble among Ayakashi, and the mother of the one she had been asked to assist. The Enenra had recognized the soul of the Bakedanuki. A youkai soul? No. A human soul? Definitely not. The soul was akin to her own nature, and upon that recognition, Kemuira had turned to her studies of the creation chronicles. It was very much a thing that intrigued her, and a thought that remained in the back of her mind, yet to be put to rest. Opening the scroll further, the smoke mononoke continued her reading and research, with the grim smile still maintained on her face. “Mistress. We have a guest… he insisted that he see you…” a voice peeped, breaking her thoughts and goal to continue reading. The voice was familiar as ever-- Rekiri, the young Nekomata contracted to her. The feline Yokai was to serve her for five years, completing chores and tasks around her palace, as well as protecting her realm. In turn, the Enenra would grant the wish of the young neko and help her find and see her close friend again, Mikuni, who existed in another realm entirely. At the same time, Kemuira also had taken the youthful cat under her wing, and was giving her lessons not in just reading, writing, history, and mathematics, but also in utilizing her powers as an Ayakashi. Rekiri’s voice did not sound as confident as it usually did, however. The Enenra’s red gaze turned to meet the citrine eyes of the Nekomata, who appeared to be almost shaking with fear. This new presence in her realm… who did it belong to, and what did they want? Rekiri had most obviously been through a rough time with whomever it was. Breathing out a sigh, the raven-haired woman simply nodded. “Very well. Let them in. You go clean yourself up; do not worry about me,” Kemuira said, observing the feline’s unease. “Yes ma’am,” Rekiri replied, nodding her head in a formal manner as she left. Despite being a servant under contract, she was cared for on what seemed to be a personal level by the Enenra, and Kemuira handled her charges with care and kindness. Seconds after the dark-haired Nekomata left the room, a larger figure ventured into the room, with a swagger in his stride. He was extremely tall, with a muscular build and strong frame, but not overly so. He seemed lanky despite his build, lithe, and fast, as if he were a star athlete. His muscles were toned, and his skin tanned from natural sunlight. Clashing with the hue of olive skin, however, was powdery baby blue hair. His eyes more or less matched the color, and appeared as azure orbs of brilliant afternoon sky. He wore white pants, hands resting in his pockets, with a black jacket left unzipped, exposing his chest. As he moved past the doorway, however, a white tail protruded from under his hoodie and above his trousers. The tail was long and slender, that of a feline, though still strong, not delicate or wiry. It was streaked with stripes of black moving perpendicular to the length of the tail. His ears were not those of a human, and were long, pointy, and animalian, covered in blue and white fur. “Inteus,” Kemuira quickly identified as the large man grinned, revealing four sharp fangs from his elongated canine teeth, on the top and lower parts of his mouth. “What brings a wandering rogue like you to these parts?” she continued, following by her breathing in some of the smoke from her fancy pipe, and breathing it out gently. “My day was going fine until a certain intruder came across my realm. Enough of the pleasantries, Inteus. I am not in the mood for your games. What is it that you want? Speak your mind now, or leave,” Enraenra snapped, unable to control her temper in the presence of the legendary tiger yokai. Patience was not usually hard to come by for her, though the feline’s condescending behavior was quick to make it wear thin and swiftly deteriorate. The man paused for a beat, before snapping his fingers and allowing a jar of sake meant for travel to appear in his hand. He held firmly to the strap of the tan clay bottle with a fine, shiny finish. On the front was written 酒, in clear and bold kanji. “Before you ask, no, I did not come here to drink with you. It has taken me a good amount of time, but I finally found it… the grave that hosts her,” Inteus said, a solemnity coming over him as the playful smirk was wiped from his face. “How interesting and daring of you to track it down and take it. I do not believe you have come here to offer the soul to me, though. What are you here for?” Kemuira cut in and asked, smoking her pipe slowly in anticipation. “Our… my… daughter has reached a point where she no longer needs the protection of her mother’s spirit. Rika was shielding Izayuki from the effects of her own memories, but at this point in time, it is only holding her back. Even if I spoke with her, she won’t leave her daughter. She has become too attached. What I need is for you to teach me how to connect my wife’s spirit back to her soul, and break the connection that she has with Izayuki’s soul,” Inteus explained, crystal blue eyes locked on Kemuira’s red ones, unflinching. Inteus released a low growl in agitation as the smoke yokai saw through him, obviously using her powers to read what was on his heart. He was passionate about this, which was why he sought out the Enenra. The truth of the matter, his reasoning, could not be so easily hidden. “Please…” his voice trailed off, still strong and determined, though more submissive than before. “What have you to offer me? You do realize that I never fulfill favors for free,” the Ayakashi of smoke stated flatly. Normally, individuals would offer to be in her debt or service, or pay her in special items or favors. “What does a straggler have to offer to the magnificent Enraenra-sama?” Inteus responded sincerely, despite the slight trace of sarcasm. “Another night in bed won’t satisfy you~” he quipped afterwards, before popping a slight grin. The tiger yokai flinched as the Enenra stated her demand. Was one of his own future children or grandchildren really worth the knowledge he sought to learn? Was she referring to Marschal, his only son, half human and half Ayakashi, or someone in the future? Would they be worth the chance to free his beloved? Defeated, Inteus bowed his head and nodded. “Call it a deal,” he murmured, attempting to push away the premonitions and guilt. Surely by then, he would not longer care about anyone in his family other than the one he had been separated from after finally finding happiness. In truth, his first lover had been Kemuira Enraenra. Due to the Enenra having the blood of a deity, and Inteus the blood of a human, he was unable to remain in her presence for long, despite the both of them being Ayakashi. Children would not come from their union, and Inteus was released, leaving her with a heart longing and broken. Still, his spirit and blood remain precious to her, enough for her to seize the opportunity to claim one of his young as her own. This was an acceptable fate for his family, if it meant saving the one he had truly discovered he cared about. It would not be long. A long road on a gloomy day, the atmosphere sullen and the skies gray and foreboding overhead. The scene did not yield a happy stretch of travel for the one who dare tread the paths that led deep into the wilderness. Perhaps there were faster ways to get there, but scent could only be followed while one traversed the land. Rosy eyes gazed up at the unhappy skies, almost with contempt. When had she last felt such a nasty feeling from within? The mononoke was usually one that was perky, optimistic, and full of life. However, since that victory, which would almost better be called a defeat, it had not remained as such. The young mage she had come to love and trust with her very life sought to return to his home and confront the ones who had shattered the happiness in his childhood. At such a young age, nobody deserved to go through such a thing. She had stopped him as he tried to sneak away, but as she heard him out, agreed to tag along and help him. It was the goal he had worked so hard for, after all, and who would deny him that, in their right minds? Not only that, but she had made him a promise shortly before their engagement, that she would assist him in taking out those who had wronged him. In order for him to agree with her traveling to Shadelle, also her former home, with him, he challenged her to a fight to prove her strength. If she could handle his own power, he declared she would be able to handle the nightmarish levels of the Lerale village. And thus, the two had engaged in combat, with the promise of no holding back, and for Elyx, no suicide jumps, as he had pulled in their last duel in order to bring things to a quick and depressing end. As the fight went on, Izayuki had learned that there was a rather dark and sinister spirit aiding her husband, pulling the strings and using magic from the shadows. The shady deity was a raven-haired woman, who eventually declared Elyx weak and unable to match the power he would encounter in Shadelle. With a few soft words, he gave in to defeat, and had tossed her a small musical note charm, that appeared to be a key of sorts. Just like that, he then vanished-- disappearing into his own little reality, Utopiasphere, which was far away from anything the young ayakashi was able to reach or access. A depressing end once again, no doubt, and though she had been claimed victor, was it really so? Morning finally came, and as she had told herself, she would head on towards Shadelle herself, if he did not reappear before her. Was he going on alone, or hiding completely in shame from his defeat? It mattered not; she was not a wanted face in Shadelle, nor did she have a bounty on her head. She could reach her former homeland without any difficulties, to check and see if her spouse had gone on without her. The dark spirit spoke negatively to Elyx, and while Izayuki cried out for him not to listen to her, her words were likely lost in his blur of unhappy emotions. So here she was, walking down a bland path towards the sea. She was taking the long way there, hoping to avoid the dead forest. The spirit of the woods had long since left its home, leaving a mass of dead trees, floors of fallen leaves, dried up rivers, and no sign of the spark of life or warmth. It was there that Izayuki had been whisked away by Rekiri, the Nekomata, to Kemuira Enraenra’s realm. A youkai of smoke, though not one that the tanuki ever wanted to meet again, despite how fascinating and alluring she seemed. The Enenra had helped her in settling the internal conflict between her drops of human blood and her youkai identity. It was a painful and confusing experience, however, and not one that the Bakedanuki wanted to relive or go through ever again. As a result, she followed her instinct, and chose to navigate around the deceased lands, in order to make it to the coast. Once there, she could fly across the sea to reach Shadelle, an island continent that lied a good many miles away from the shores of Fiore. With her was her companion, the tiny, alabaster-furred yokai, Seika. The small white mew-like creature was a hybrid of many sorts, who identified with really no other yokai, despite her having the appearance of a feline mamono or perhaps an itachi or kitsune. One thing was for certain-- despite what she physically seemed to be, the cyan-eyed ayakashi was none other than the Glacier Goddess herself, and not from the world of Earthland. She came from some unknown, foreign world, and upon being seemingly forced into the present world and universe, was split into two- her personality, and her power. Seika herself was the personality of the once whole deity of ice and winter. Her power was the one who Izayuki had grown to know as her fearsome mentor, Yukionna, whom she had sworn to eventually kill. Ruining her life was one way to put it, as, like her spouse, she had no trace of happiness in her younger years. A human village had taken her in, and a member of the village, secretly a feline yokai, Naugrem, even taught her to use a sword. The power of the ice goddess eventually came to destroy the village, taking the lives of every single friend and family the tanuki had ever known. Happening upon the small eastern raccoon dog, alive despite the icy temperatures and deadly snow, Yukionna chose to take in the Bakedanuki, and give her the power to slay gods, by ridding herself of her own impurities. Despite escaping Yukionna’s realm and the brutality of the cold and harsh training, the magic remained with Izayuki as she continued to grow, and gain strength. Eventually, she would take down the one who had given her hell and even to that day, remained in her nightmares, haunting her sleeping moments. Still, Seika had revealed the truth only recently, after painfully stealing some of Izayuki’s God Slaying magic to fill an empty lacrima. Seika remained with Izayuki, though had not spoken much since, and refused to acknowledge what had happened. Whenever the Bakedanuki brought up the incident, Seika left it ignored, and would sometimes leave the situation together. At some points, she would even threaten the tanuki more, scaring her into silence. Because of the small yokai’s true identity, Izayuki knew exactly what she was capable of. There would be no underestimating her. Seika had divine control over ice, and trumped even the slayer’s own resistance to it. At the same time, the guild master of Black Rose could not bring herself to view her ‘companion’ as an enemy. This was not the person she wanted to bring down, and had worked her entire life to gain the power to do so. This was a friend that she had once rescued, and in turn, the ayakashi had stuck with her through many trials, and had saved her life more than once. How could she turn on her because of the newly-discovered identity. Besides, just because she was one half of the glacier god, it did not make her Yukionna, the embodiment of her power. Still, the night on the roof was always lingering in Izayuki’s mind, as there was no closure, no matter how many times she had sought it out. She continued walking along the sullen trail, with Seika floating nearby, sometimes levitating a few feet to many meters ahead of Izayuki, or perhaps a bit behind. Only rarely did she travel alongside her tanuki companion on this road. This time, the alabaster furred beast levitated ahead a couple of meters, moving down the same trail that the Bakedanuki was following, in order to skirt the dead and lifeless forest. However, as Seika continued forward, her sensitive ears heard a light thud sound behind her. Peering over her shoulder, cyan eyes widened as she focused in on the pink-haired tanuki girl fallen over, to her knees, with clawed fingers and her palms holding her upright on the dirt road. “Iza, what’s wrong?” the yokai dared to ask, quickly floating back over towards the fallen, and panting, girl. Izayuki appeared as if she had something to say, and attempted to give an explanation, though found no words as felt an intense pain flow through her, starting from her soul. Was it the spirits of Wonderland yet again? The pressure felt like madness, as it surged through her body, immobilizing her and leaving her unable to walk, or make any normal movements. Why now, of all times? Was it because she had dared to use her Wonderland abilities back during their duel? Seika had suggested she do so, and utilizing her secondary magic had allowed her to see the raven-haired spirit who was aiding Elyx at the time. Was this the penalty for using the soul magic gifts of Wonderland? It was really not much of a trade off. Ignorance was bliss, and Izayuki would have preferred to have never seen the sky deity, and known about her helping and later discouraging her husband. Within seconds, the guild master of Black Rose felt her arms growing weaker, as the strength was sapped out of them. The Bakedanuki crumpled completely to the ground, keeling over with no sign of repose. Why was this happening now, of all times? Her eyelids grew heavy, and after a few struggling heartbeats of time, rosy hued eyes were completely sealed shut. Izayuki had fallen unconscious, with her now worried companion calling out her name, but to no avail. What was there to pursue now, except the darkness that she had come to know so well? Despite that, something was coming into focus-- a story that would slowly unravel itself before her. Blurring into focus was a scene, the scene of a dream, that was, put simple, a single lifetime. It all began in simple ways, by simple means, under a loud crash of simple thunder. The six tussling and tumbling kittens started at the flash of the lightning that came first, and darted towards their tailless mother for safety from the monster of great noise and light that lurked outside. Giggling, the mother lowered herself to comfort her now trembling, mewling, and scared children. The mother, though without a tail, was undoubtedly a beautiful feline, with sleek, silver tabby fur, with a few pearl white patches on her paws, chest, underbelly, and muzzle. She had the most brilliant blue eyes, and it was no surprise that the father of the kits had rescued her from the terrible depths of the 'dungeon'. The dungeon? Why, a prison? Or rather, it was a deep, dark, rotting basement of that Decrepit Mansion. The Elite made their home here, and what was the Elite? Put simply, it was a group of wild, feral, animals, and was founded and mainly dominant by domestic cats. At that point in time, there was some miscellaneous animals- a lynx, dog, coyote, wolf, marten, or two- hanging around, but nobody that a mass of bloodthirsty, feisty felines could not put up with. That was right, the Elite was what was considered an 'anti-clan' by their animalian society. They rebelled against the standard, traditional, systems, and founded their group on a set of rather morbid and beastly structures. They delighted in attacking and harassing other clans, slaying and killing random, wild animals for sport, and torturing any captures or prisoners. Their cruelty did not end there, however, as their former leader of the Golden Age, Capone, set shining examples for her group. She remained their leader for a long time, but soon the torch had been passed to Sorna, Capone's daughter. Sorna proved to be too weak to handle the responsibilities as leader, and too soft-hearted for the cold, brutal Elite cats. Thus, she fled and promoted a child to rule in her stead, Vasilica, who was reared and raised to be a fair leader... she was in command now, and not doing too poorly. Then again, it likely was her group of advisers doing the real leading- not the kit. One of the Elite's cruel customs was if one were to pick a prisoner as a mate, the prisoner first had to sacrifice their tail. An eagle feather also had to be sought out by the couple who wished to have a litter of kittens, if the union and delivery was to be blessed by the 'others'. The gods, or perhaps better known as Daemons, but not to stray from the subject- the father of the six was a blueblood, a tomcat of royalty, Vasilica's older brother, Avrigon. Avrigon perhaps was smitten by the silver tabby she-cat's beauty, or perhaps he simply felt some shred of pity for the poor wreck of a cat that was shut up in an old crate, terribly malnourished, with signs of recent torture. She had even forgotten her old name and past, was mentally traumatized, and simply introduced herself to Avrigon as 'Caelum'. Even if it could have been a trick, Caelum accepted the removal of her flowing, fluffy tail in turn for the shred of hope that she could escape. She was not disappointed. Avrigon picked her to be his princess of sorts, and she gave him six healthy children: three sons- Yassen, Renais, and Lector- and three daughters- Aethera, Ecclesia, and Aestes. And here they were now, all huddled up beneath their mother, praying to whatever deities that were out there that the roaring, bright, flashing monster would not get to them. Caelum purred reassuringly as her children gathered under her paws, mewling desperately. "Now, now, my dears. That is just a bit of lightning and thunder. Lightning comes first, making a bright flash, while thunder is the loud noise you hear after it. It might sound scary, but it can't hurt you," she explained gently, with a warm smile. Some of the kits seemed to understand, and dared to venture out, while the rest remained under the safety of their mother, not quite convinced. Eyeing Yassen, Ecclesia, and Aestes still trembling quietly at the paws of their mother, staring with scared, fearful eyes around the room, Caelum gently nosed them. "Little princes and princesses can't be scared of nature. Go on and play, and don't worry about the storm out there." Yassen blinked a few times and padded cautiously away from the silver tabby she-cat, pausing only once to look back and see a reassuring nod from Caelum, before scampering away to play with his siblings. Seeing the fun her siblings were having amidst the deafening and blinding storm going on outside, Aestes was the second to the last to follow Yassen and venture from the safety of being directly next to her mother. Within a few heartbeats, she too, had overcome her fears and was reaping the benefits. The last to follow was a certain she-kitten with a much more tender, shy, and gentle demeanor. She had a beautiful pelt just like her mother's, only the bright silvering in her tabby stripes was tinted with a faint chocolate hue. The white on her chest and underbelly was blended in and not as blatant or stark as Caelum's. However, she shared the same deep, azure eyes that seemed to be a window displaying bright blue sky on a clear day. Many more days passed, and the horrors of the storm finally came to an end. Despite no blue skies being there to make their presences prominent, the thick blankets of gray somehow seemed warm and comforting, and not cold at all. The only thing that lingered as a cold feeling in the young kitten’s mind was the promise of the decree to be carried out. Vasilica, the current leader of the Elite, was growing up under the ruthless care of the Listener, or in better words, Adviser, Syryn. Syryn was ferocious tortoiseshell-furred she-cat with blazing yellow eyes, who was known as a seasoned fighter and feared torturer, who delivered punishment to any feline unfortunate enough to find themselves in the dungeon. Sorna, the leader who preceded Vasilica, had promoted Syryn to be her close second-in-command, only to leave the Elite shortly after, completely running away… while leaving a kitten in charge of the evil group of rogues: Vasilica. Syryn had quickly assumed at least a fair bit of power, though along with having a good amount of influence over the Elite, she was forced to become the nanny of the young leader. Now, Vasilica was old enough to be a mother herself, and Syryn’s duties remained- she was the second in command, an Adviser, though still was well known as a ‘royal nanny’ of sorts. She was fairly present in the lives of Ecclesia and her siblings, even though Caelum did most of the raising, and Avrigon simply doted on them all. Unfortunately, with Vasilica old enough to lead the Elite without Syryn’s help, she began to make new rules and decrees based on the ideals and thoughts she had picked up from Syryn’s harsher methods of raising her. One idea was the topic of an army of kittens, chosen when young to join the guard, and be trained to be a ruthless and terrifying fighting machine. They would take orders, and be the strongest, most heartless warriors the Elite ever did see. At least one child would be chosen per litter, and Vasilica had even promised to give up some of her kits for the horrifying ‘cause’. Once the news of the decree had reached the ears of Ecclesia, how could she not fear what was to come? Children in the guard would be separated from their mothers, and given extensive training with an iron fist. There would be no warmth or love for those young ones, and like any kid, the last thing they wanted was separation from their families. These thoughts lingered in Ecclesia’s mind, and made her grow more and more desperate to stay with her family. The fact remained that at least one of her siblings would be removed from her life…. But she could live with that, as long as it was not her. The traitorous thoughts continued to ring in her mind as she walked through the halls of the Decrepit Mansion. It was true, being a kit was exhausting, with constant wandering and nothing to do, fierce playtime and long games of moss ball… she was ready to be a trainee, to see more of the world beyond the dark and rotting halls. As she walked, lost in her echoing thoughts about the kit-army and various other childish things, she almost did not notice the voice that sounded nearby. “Hey Lessy,” it said; a nickname, causing Ecclesia to gaze up from the old and worn floors and peer curiously at her slightly elder sister, Aethera. The nickname was new, and likely something that blue smoke she-kit had come up with on the spot. Aethera padded up to sit near her, forcing Ecclesia to completely stop in her tracks in order to acknowledge her sibling. “Something up?” Aethera would ask, likely noticing the fact that the silver chocolate tabby was lost in thought, though only assuming it was over something silly- like missing her daily nap. “No, not really,” Ecclesia would reply, lying, not ready to let anyone know what was on her mind. She had those regrettable and traitorous thoughts…. Why would she dare share them with a littermate of all people? Aethera shrugged in response, despite quietly being almost positive that something was poking at her younger sister. “So, who do you think is going to the kit army?” she went on to ask the chocolate-tinted kitten, having been wondering the same thing. The thought was terrifying, and easily scared her as well. Who would not be scared at the thought of being taken away so easily? Oh well- at least in the kit army, one could make new friends… maybe. Hopefully? Brave words, and she made obvious the fact that she did not want to go, though she presented it in a different want; one contrary to what she was thinking. After all, what good would it be to show fear in the Elite? The silver chocolate tabby quickly shook the thoughts away before her body language could betray anything. She would be screwed if anyone else heard her aloud, most likely. The reaction from Aethera was not what she thought it would be, however, as the blue smoke rested her tail on Ecclesia’s back and purred gingerly. “I wouldn’t let them take you,” Aethera promised, grinning at the smaller kitten. Her sister wanted none of her siblings to be taken away, but with the popularity of their father and the fact that they were of royal blood, there was no way they could be hidden. “Really?” Ecclesia breathed, incredulous that it was really that simple. Was it just that she was good at manipulating? She had not tried to do so, though it had still subconsciously happened nonetheless. Or was it that her sister was simply just that generous? Perhaps; Aethera was the oldest of the six, and undoubtedly the bravest. Having heard the voices of two of her daughters, the silver and white tabby she-cat turned the corner to see both Ecclesia and Aethera sitting close and talking amongst themselves. Ecclesia only noticed her mother at the last second, finding the timing rather thoughtful. Avrigon prized his children above all else, and though their mother was the one to raise them, the idea of her getting closer to them than she was not a favorable one. Nevertheless, they needed someone, and their doting father was not around all of the time. Assuming she would be fine, Caelum approached her children, and gave Aethera’s fur a few rough licks, as per typical feline grooming. “Is something wrong? I couldn’t help but overhear,” she purred, giving both of her daughters a soft look. She knew what they were worried about, and the realization was painful. She, too, dreaded what was to come, concerning the decree of Vasilica and the kit-army. She looked up at her mother, surprise floating in her pale green irises. Usually, Aethera would've ignored her-- she wasn't a big fan of grown ups-- but Caelum was her mom, one of the few adults the silver smoke could trust. "Well, kind of, yeah." Aethera sighed, knowing the older she-cat knew yet telling her anyways. "The whole kit-soldier thing. A-Are you sure you can't do anything about it?" Her parents had power in the Elite, Aethera knew that, yet she still couldn't grasp why Caelum of all cats had to give up one of them. The concept in general was just stupid. "I'm afraid there's nothing I can do. Even Vasilica is going to give up some kits in her litters," Caelum sighed. "But really only your father could do something about it. I'm his mate, but I was never an Elite cat." Aethera glanced back up at her mother as she felt the warm, gentle licks. There was some mild surprise in her light green eyes; typically, she would have ignored Caelum, as she was not fond of the grown ups. However, her mother was special to her, and was one of the few people in the world the blue smoke felt like she could trust. “Well, kind of, yeah,” she sighed, knowing that her mother probably already had listened in, but expected to hear it again herself. She sighed slowly, knowing it was all true; the Elite leader herself had given up a few of her own children. Though there was still that mild glimmer of hope that he could pull a few strings, the chances were slim overall. Still, Aethera would not allow any of her siblings to be taken away. Not that she really had much strength or power over doing that in reality, though she was still determined. Although she had barely spoken to many of her other siblings, the children of Avrigon and Caelum, as of late, the kitten did not want to watch them be brought under the wing of the guard and taught to train and fight at such a young age. "If he can't get us out of this and if none of the others have volunteered..." she began slowly, taking a deep breath. It was such a risk to volunteer to such a brutal idea, but Aethera had carefully thought it over from the start. Her siblings-- even a few of the toms-- were skinnier than toothpicks, and she had already begun a growthspurt early; she was more fitting for the job. And, if she finished this combat alive, Aethera would be able to protect her family better. "Sign me up." "I can try my best to hide you, but if they remember that I had kits, they'll take one of you," Caelum sighed. “If he can’t get us out of this and if none of the others have volunteered,” Aethera took a deep breath and began to slowly speak. Volunteering to the brutal idea was an enormous risk, but she had thought it over carefully ever since the start. Her siblings, even a few of her brothers, were skinnier than a toothpick, and she was the first to enter a growth spurt, so surely that made her more fitting for the job. If she could finish the combat training alive, she could better protect her family. “I can try my best to hide you, but if they remember that I had kits, they will for sure take one of you,” the mother she-cat replied with a sad sigh. Aethera nodded to her mother, while Ecclesia sat by, wide-eyed in awe at her sister. Would she really go that far? She had not been manipulated in any way by her younger sister, had she? “Thanks,” the older she-kit muttered, as much as she would hate to say it any other day. However, hiding her own children from civilization was something to be thankful for, as it could either spare or hurt the lives of Ecclesia, Aethera, and the rest of their kin. Moons passed. Eventually a meeting had been called by the leader of the Elite, Vasilica herself. The brown tabby’s voice rang throughout the halls of the Decrepit Mansion. “Everybody listen up! This is important!” she called, awaiting for the others to gather before the throne of the leader. Once upon a time, the first leader, Columbine, had occupied it, followed by her daughter, Capone, shortly after her death. Sorna, Capone’s daughter, had failed in leading, and left Vasilica in charge. However… her own time, like her predecessor’s, was up. She had greater plans in mind. Syryn had not taught the kitten to speak as formally as a leader should have, but in the Elite, what did it matter? Avrigon, the silver chocolate tabby tom, was the first to walk up towards the throne, where Vasilica sat before leaping down to greet her brother. “I’m honored, Vee, but are you sure?” he asked respectfully, attempting to let the short but mandatory announcement sink in. Ecclesia bounded up towards her father and aunt, attempting not to burst with excitement. “Thank you, aunt Vasilica!” she squeaked. Vision faded. Another scene began to make its way into her mind, shrouded her in the story it had to tell. The day had been absolutely exhausting, with few words to describe just how busy and strenuous it had been. Just the thought of going through it again mentally was too much for the five moon old she cat. Sighing, Ecclesia hopped up onto the soft mattress of the intricately-made up bed, in a room dedicated just for her father, mother, and the rest of her family. Indeed, it was early, and her beloved dad, Avrigon, likely would not hit the sack for a good while. Nevertheless, the young leader was finished with the day, and ready for it to be considered lights out. Caelum was one feline in particular who remained on the leader’s mind, however. Oh, how she hated her mother-- after she had revealed to her children that she was once a prisoner of the Elite, Ecclesia had lost all the respect she once held for her mom. Just like that, if word ever spread, it would be known that she was illegitimate, not a full blueblood. That was not something that could linger for too long, as the general stress of the day was something that she would have to grow accustomed to. Each month, there was the orientation, and each day, there was something that was needed by many individuals that made of the ranks of the Elite. It was exciting that he had been made leader so young, despite knowing that Vasilica had been younger when she was appointed. How could such a tiny kid handle the rather large burden? Shaking those pointless thoughts away, drowsiness tugged at her, making her eyes grow heavy. Something was urging her to sleep… but something more than just the exhaustion. Something dragged her to bed, and sleep approached easily and softly, falling like a dead leaf at the end of autumn. Eyelids sealing brilliant blue eyes, Ecclesia sunk into darkness. The darkness was quite different, uncanny, and unlike the darkness one would experience behind closed eyes or on a moonless night. She could feel it-- darkness was something that could be seen, yet the silver tabby was not sure that it could be detected by any other physical sense. Was this some hallucination or illusion, possibly? She was not sure, but it was almost overwhelming, stirring the young kit’s instincts to long to turn and run…. But… to where? “Is anyone there?” she called out, wishing that Avrigon, Vasilica, or even her disgraced mother would come to her. It was frightening, being able to feel the darkness, and to smell, taste, hear, and touch it. Scared, she closed her eyes and tried to shake it away, praying to whatever benevolent deities that were out there that it would stop. She wanted to cry out and scream, but found her voice lost in the pit of midnight… anything to end it. Anything. Even if doing so would prove her a coward, Ecclesia started quickly to consider it. Though, a blur seemed too come into the darkness. If it was dark, the leader didn't understand how it could be seen. It wasn't light, that was for sure. Backing up, the chocolate-silver closed her eyes and unsheathed her claws. If she had to fight to get out of this place that was worse than hell, she would. Even if screaming would prove her a coward, should this be nought but a nightmare in the end, Ecclesia no longer cared. However, her attention was whisked away as a blur would come into focus, off in the distance, in the darkness. Black as it was, the leader did not understand how it could be seen. There was no light, that was most certain, so what could it be? Taking a step back, the silver chocolate tabby closed her eyes and unsheathed her claws. If she had to fight to get out of this place, that could only be accurately described as some form of hell, she would. Finally, the view of the blur came into full focus ever so slowly, eventually becoming as clear as crystal. “Hello?” the child asked nervously, observing the form take a shape. It was that of a canine, no doubt, and a fox, at that. The color of its fur was black, tinged with silver, with a snowy tail tip, and obsidian paws and ears. Eyes were a stark and shiny shade of amber, yet close to the onyx pupil, held a green tinge to them. This was none other than a silver fox. By no means was the creature natural, as it walked in out of the darkness. It was much larger than Ecclesia would expect out of a fox, and gave off an unnerving vibe. One paw in front of the other, it drew closer to the small she-cat, before finally stopping a good meter before her. “Who are you?” the kitten asked nervously, trembling in the presence of the creature of the hellish nightmare. Only now did Ecclesia grow better aware of what this was. In her younger moons, she had been taught that only spirits retained the ability to present themselves before mortals like this. “What do you want with me?” she asked, unable to keep her voice from shaking. Appalled, Ecclesia only nodded slowly, continuing to tremble as she stared at the silver fox. “Why are you telling me this?” she breathed, recalling the terrifying stories. At the words that horrified the kitten, she longed to scream and run away, to where this was not reality. She would run to anyone, wishing she was still one moon old, huddling next to her mother’s warm body and soft fur, alongside her siblings. This spirit was essentially telling her that she was to die. “W-why…” she choked out, blue eyes wide in utter shock and disbelief. “Power?” Ecclesia echoed, hoping she was following the words, as almost everything was filtering out, at this point, for her overstimulated and frightened mind. Only since the Daemon spoke it to her, would the ability be activated. Ecclesia nodded, though silently prayed that the spirit would have no more words to say. After all, it seemed that each phrase that parted from the fox’s jaws was only a foretelling of death, or worse. With that final word ringing out like the last toll of the bell at a funeral, the darkness devoured her again. The fox was no longer there, and the child began to finally release the pent up emotions. It started with a peep, followed by a cry of anguish and fear, no longer able to be bottled up. She feared for her life, and closed her eyes as the tears fell. Why could this not all be a dream; one that would never come true. She knew better; dreams never seemed this real. Peering through a thin line of film from the tears clouding her blue eyes, Ecclesia saw her silvery chocolate paws as she awakened from the nightmare. Realizing that she was release from the terror, the leader shook herself awake. Why did this have to happen. Was there any real reason she could question? She would rather die and reach a different form of hell, rather than have her body given to another, as her soul went somewhere unreal, disappearing into the sands of time, far away from the reach of existence. Moons went by quickly, and the leader grew as the moon waned and waxed for several more cycles. What began to come to mind for the ambitious feline was the legend of her predecessor, a leader who held the throne of the Elite a few generations before her. The silver and white calico had led the golden age of the group. Capone, her name, the daughter of Columbine, the founder of the Elite. The one whom Ecclesia was most envious of. Was it her power, or perhaps her popularity? Yes, she was dead, but it had only been half a moon ago that the spirit of Capone approached Ecclesia sitting on her former throne. The dead she-cat demanded her throne back, and it had proved rather difficult to convince and remind Capone that she was indeed no longer alive. Naturally, Ecclesia was not the only one who felt a deep-rooted envy towards her predecessor. There was also Invidia, the great Daemon of Envy who also craved everything the other Daemon had. Capone had been a Daemon, unbeknownst to Ecclesia, and had been since birth; unlike Invidia, who was allowing her host a few moons to play leader in fear. However, before too long, a Daemon would once again sit upon the throne of the Elite. Invidia had assumed the form of a handsome silver fox. Waves of memories from previously taken lives tormented her, and many more were to be added. Thus was the fate of a Daemon. Presently, however, she had tired of waiting. Ecclesia had nearly reached it-- the limit of her envy. She shared the same goal as the Daemon whom had claimed her; to be like Capone. To create the same legacy. It was only rather recently that Ecclesia had decided she wanted this, after she met the former leader’s spirit. It was easy for anyone to grow envious of Capone. For Invidia, a Daemon who lurked through dark hellish forests was odd enough. Killed by her own children. It was an amusing, but nevertheless unique end. Settling down for the night, the silver chocolate tabby rolled over onto her side and stretched a paw far into the air. Something was not right in the least. Uneasily, she shifted, flicking her tail back and forth while clearing her mind. Closing her eyes, she tried to calm herself, put an end to uneasiness, and ignore that unnerving presence in the room. Reopening brilliant blue orbs, she awoke to a nightmare. Standing in front of her was the being she feared the most-- Invidia. The Daemon stood before her, gazing at the leader with both excitement and cruelty flickering in her bright orange eyes. A vicious smile was plastered on her face, leading Ecclesia believe that one thing she had dreaded the most was here. “It can’t be time yet,” she breathed telepathically, with the ability that the Daemon had granted her. “It is,” the ghost murmured, staring right into those blue eyes with her own piercing amber. Instantly, the young feline cried out, attempting to leap backwards. “No! There is no reason for you to be here!” she caterwauled, truly fearing for her life and fate. The word, ‘no’, echoed through her mind over and over again, unheard by all. The question startled Ecclesia. It was the most horrifying thing she ever heard, and also one of the best. Could she really rival Capone with Invidia? Could it be true? The silver fox was reading her thoughts, though she didn't worry at the moment. She had no choice in the matter. The Daemon would take her willingly or not, so best be brave and willing, than scared and cowardly. She would have no regrets, even if her heart was pounding as adrenaline coursed her body and mind. Quite the confusing moment, though Ecclesia at least would not leave in the pathetic manner that Invidia expected. Giving a long sigh, the leader gave the smallest nod. The deep breath before the plunge. Ecclesia would be no more. Feeling a gripping and painful sensation, the now former leader felt herself disappearing. Stealing a last look upward, the silver cat closed her eyes, allowing darkness to take her. She knew there would be no waking up from this nightmare. Where would she go, if anywhere? Ecclesia breathed out a long sigh, and responded only with a tiny nod. The deep breath before the plunge, no doubt; she would be no more. Feeling a gripping and painful sensation, the now former leader felt herself disappearing. Stealing a last look upward, the silver chocolate tabby closed her azure eyes, allowing the darkness she so despised to consume her. There would be no waking up from this nightmare. Where could she go, if anywhere? No, she was gone. Gleefully, Invidia slid her own soul into the young feline’s body, settling in with contentment surrounding her. Invidia stole the final traces of the old leader’s memories, many left behind in her abandoned mind. Just like that, she made herself at home. A Daemon was once again on the throne of the Elite. Invidia would take on Ecclesia’s name, personality, rank, and body, all while remaining true to herself-- a Daemon of Envy. Envy had brought down the fallen Ecclesia. Would it be the same for the ancient spirit? The dream began to fade out, the lifetime left incomplete, or so it seemed. The origins of one of my longest played OCs for filler. Am I ashamed? Only a little. “Not quite what you wanted to see, I take it,” a familiar voice cooed gently in her silver-furred ear, making it twitch as she stirred from sleep. Rosy hued eyes awakened to pure darkness once again, the black atmosphere having no remorse or mercy when it came to the youthful Bakedanuki. Blinking groggy eyes, Izayuki began to sit up, disliking the empty void of night that was the depths of her own mind. Whenever she was here, some misfortunate always followed. As she finally gained her bearing, with one hand gingerly holding her throbbing head, Izayuki began to piece together what she had just seen. The memories were brutal, as she recalled, and definitely not her own. They were the memories of some mortal feline, a humble domestic cat, from long ago, from some unfamiliar universe and world. Why was she seeing this now? Izayuki turned her head to gaze towards the speaker, who was none other than who she expected it to be-- Bandersnatch, one of the more interesting spirits of Wonderland. He had brown hair and hazel eyes that flickered with a slight tinge of glowing, sulphuric yellow. His choice of attire was modern- jeans, and a casual shirt and hoodie. On his head was a hat with two unknown animal ears, as if he were a feline or fox. He was an odd one, a monstrous creature who dared never reveal his true form. Out of all of the spirits of Wonderland, seven souls tied smoothly together, bonded to madness magic they could never free themselves from, he was the friendliest. So far, at least. Izayuki would not be too surprised had he tricks or bribery up his loose sleeves, though whenever he was around, he seemed more willing to help than to harm. That was… Alice? The being who had contracted with her in a vulnerable state in order to grant her wish for power? Did such a strong being really start out with such a pathetic beginning, as a mere cat? Could it be that all of this was some Bakeneko or Nekomata’s illusion, and there was no contract there at all? No, Wonderland still existed. That much was true. Surely any tanuki would acknowledge an illusion instantly, had one been used. “Just one question. What is a Daemon?” Izayuki dared to ask, gazing up expectantly at the Bandersnatch. With a confident grin, he merely shrugged, ready to give her a long answer and explanation. “A Daemon, generally speaking, is a being that was usually once alive, but has remained dead and in the afterlife for so long that death became their life. They can be any kind of spirit, typically, but have lived to the point where they begin to consume souls, who then become a part of them. The more souls they consume, the more powerful the spirit becomes, as it starts to take on characteristics in regions such as appearance, powers, and even personality. As such, a being who has begun to eat souls in this manner has become a Daemon, and therefore must 'balance' what they choose to devour. Consume too many demons or tainted souls? Become one. Consume too many angels or holy souls? Become one. The same goes for neutral souls or specific ones. Still with me? Good,” Bandersnatch spoke confidently, giving his knowledge freely, in a serious manner despite the smile lacing his lips. “As for contract with spirits, generally, Daemons gather enough power to move to the Second Astral Plane - The Afterlife, in order to seek out a spirit looking to reincarnate. The Daemon may create a contract with the knowledge and consent of the contractee, or they may do it discreetly, with no formal appearance made to the contractee. Consent is not required, either. The spirit looking to reincarnate usually is returning to the Physical Realm for a reason; perhaps unfinished business, or a wish they want granted. Traditionally, the spirit may reincarnate under one of the Seven Heavenly Virtues or Seven Deadly Sins, for which you may read more about below. Other contracts can be formed with consent should the Daemon promise to grant a wish in life. The spirit must be specific with the extent of their wish; else the Daemon may twist the contract as they please. For example, if a spirit wants to be reincarnated for social power, but does not declare to what extent, the Daemon may ensure that they are born into power, such as royalty. The instant they are born, the contract has been completed, and the Daemon may take/banish/consume their soul, whichever they wish to do, and possess the reincarnate's body.… you might recall this in Alice’s, or rather, Ecclesia’s, memories.” Bandersnatch informed, with Izayuki staring at him patiently and curiously. She gave a small nod, though expected him to continue. “Finally, there is the bit about contracting with mortals. If a strong Daemon eventually gets a tight hold in the the Physical Realm, they may contract freely with mortals and other various spirits they encounter. This type of contract is usually not for possession, but is to simply have an easier time gathering souls to feed on. Strong souls are nearly impossible to hunt or catch alone, but if a Daemon has a contract with one, the strong soul's fate is sealed; they will belong to the Daemon. Often, the easiest way a Daemon will contract with a mortal is by once again offering to grant a wish, such as helping the mortal get revenge, destroy an enemy, complete a goal, etc. Once the goal is completed, the Daemon has complete ownership of the soul. Another type of contract is the promise of physical power, such as giving abilities. This usually is given from the Claim itself, as the Daemon lends use of one or more of its abilities to the person it is contracting with. In these types of contracts, the Daemon might not necessarily go for the soul right then, but perhaps ask for something in return, such as loyalty, servitude, or some sort of physical thing, even. Contracts like these often can be made for fun by Daemon, who are often sadistic by nature and enjoy watching the powers and Claim begin to potentially corrupt or despair the contractee. These are the various ways that Daemons can contract, but just like the Daemon and their potential, contracts may be versatile. A strong Daemon may develop its own type of contract, or preferences in how they go about doing it. Some Daemons manage just fine without contracts, even though it generally is a harder path to take~” Bandersnatch continue, obviously enjoying the sound of his own voice. “Is that so? Are you sure about that?” a voice sounded off to the side, to the left of the standing Bandersnatch, and the right of the sitting tanuki girl. Hazel and pink sets of eyes simultaneously widened as they realized who the figure was. The bright, golden blonde hair above brilliant azure eyes was easily recognized by the Wonderland spirit and the yokai. Izayuki glanced back at Bandersnatch, who appeared to be paralyzed in fear at the sight of Alice, the Daemon he had been speaking of. How did she find him, when he had gone through such lengths to hide himself and Izayuki, in order to expose some of Alice’s memories, as well as give her a good explanation of what she was. Though there was a sly smirk on her expression, the anger of the Daemon could be felt all around. Despite her words seeming so teasing and simple, she was masking a fury like no other. As she moved closer, Bandersnatch appeared to be unable to move, standing in place, paralyzed by shock and fear. Once Alice was in extremely close proximity, she spoke again, in a gentle manner, despite the wrath behind the mask of calmness. “I think your voice will do. I will not have to worry about thieves if they can’t repeat what they see~” she cooed, and with those words, lifted up the golden orb she had been charging, which Izayuki recognized as Carroll, up to his face. In apparent agony, Bandersnatch clutched his throat as if something were strangling him. Protruding from his mouth was a stream of mist-like energy, being absorbed into the orb of light. It lasted only seconds, though the effect resulted in the brown-haired boy falling to his knees, as Izayuki looked on, standing up, her eyes wide in horror at the scene. Alice only chuckled in a hushed tone, under her breath, as she watched him fall and held the orb floating a centimeter above her palm. Closing her fingers in to form a first, the orb began to vanish, diminishing into nothing. “Now, leave me,” Alice commanded, her expression growing much heavier, the cruel happiness from before leaving her. At her words, the void appeared to swallow Bandersnatch, his form fading from that area of her mind. The blonde watched in silence, standing still as she watched his figure completely disappear from her presence. but it's hard to say there's nothing i regret. The place was stony and cold, undeniably one of the last places he wanted to be. Only with the help and blessing of a demi-goddess smoke yokai had he been able to infiltrate the well-kept catacombs beneath the House of Lost Souls. The structure now was a palace for users of Onmyodo, better known as Onmyoji. The diviners were humans, though generally used their charms and magic against non-human beasts and monsters. Particularly evil ones. The anti-yokai humans were able to use unique seals that could render anyone who was not fully human unable to fight, completely useless and vulnerable. Inteus always had done his best to avoid anyone who he sensed could use Onmyodo, and use it well. He was good at trampling and overwhelming those who barely had a grasp of the techniques, and were amateurs at best, though he was wise enough to not meddle with any professional or master wielder. Why did she have to be here, of all places? The catacombs were huge, and gleamed, reflecting the light of pale, magical torches. Here, there were many Ayakashi, all of them awaiting trial for their crimes. What were those crimes? For some, the murder of one to many innocent people. For others, perhaps malicious tricks and fraud that were discovered. For a few… absolutely nothing. Their mere existence as a creature that was not human made them a threat, and a monster. Even for the peaceful ones and the pacifists, the Onmyoji would show no mercy. Some were chained up with unique seals to the walls of the prison. Others could roam free, though never escape. Most, at least, possessed seals on their body, often in the form of shackles on their wrists, ankles, or necks. The sight disgusted the tiger yokai, who was here to begrudgingly rescue someone he had hoped to find in a more casual setting. He grasped his sake bottle tightly, and began to search the vast holding area of the Onmyoji. Fortunately, his daughter would not be too tough to locate. Her scent was extremely similar to his mother’s, as well as his own. After several minutes had passed, Inteus had located the ginger-haired Bakedanuki, crumpled on the stony ground and unconscious. She wore a shackle around her neck that appeared to be created from some pale blue onmyodo energy, connected to a chain that was firmly attached to the wall. “Wakey wakey,” he grumbled, crouching down near the tanuki girl, pained to see the condition she was in. How had she allowed herself to be kidnapped and brought to this hellish dungeon? Darkness ensued. A brutal and cold darkness as a mixture of a searing heat and burning cold in some unknown energy began to destroy her sense of vision. A scream tore from the Bakedanuki as her sight was stolen from her, both physically, and spiritually. Just like that, the Daemon vanished, and Izayuki was alone once again. After what felt like hours, the pain finally subsided, and the half-conscious, fallen tanuki dared an attempt at opening her sore eyes. As she did so, there was nothing to be seen. Only a deep, black, void pit all around. However, there was a new scent. At the very least, she had been permitted to keep what she deemed the most important of the five senses. No longer was she in the wilderness, out skirting the deceased forest, aiming to reach the sea. The air felt cold, and only polished stone could be smelled all around. Rock, marble, metal, and magic. From her experiences, this was never a good combination. Also tinged with those smells was something familiar; the signature of a group of people that the guild master of Black Rose desperately wanted to forget. The users of Onmyodo: Onmyoji. The last time that she had experienced an encounter with the anti-yokai humans, she had struggled to fight. They were skilled in sealing her power, and the only thing that had saved her was going berserk and forcibly turning one of their own, a young girl, into a Youkai like her. Specifically, a Kasha Bakeneko, a giant, monstrous feline that would feed on the dead and critically wounded. With the Kasha in a frenzy, Izayuki had taken the window of opportunity to escape from the horrible people who wanted her taken down, despite her reputation of being friendly with human. She was a monster, but not one who had killed in cold blood, or consumed the flesh of a human. The air was silent for the most part, still and quieted likely by some form of magic. Still, the warmth from the bodies of others could be detected all around. So why were her senses dampened, and why did nothing give her any leads as to where she was? There was too much adrenaline rushing through her veins to really acknowledge fear. “Finally awake, are you?” a masculine voice asked, his presence looming over her. Slowly, Izayuki attempted to lift herself off of the cold ground with her arms, weakened for some reason. As she did so, she recognized the cold, slight choking sensation on her throat from the onmyodo chain. If her calculations were correct, she had been captured while she was unconscious… and if that was so, she would have many more questions. Blunt and to the point when suspicious. Just like her mother, Inteus noted. “I see. I guess you don’t have to believe me, but there was once a powerful, and beautiful, Bakedanuki known as Rika Riyoshi, later Rika Riyasu. She fell in love with a wandering yokai, and abandoned her prestigious clan. Eventually her clan managed to capture her husband, leaving Rika with her unborn children to later defend. Only one child survived, though as fate would have it, Rika’s life eventually came to an end while that kid was still young… still with me?” he asked, staring down at the tanuki girl with heavy blue eyes. “But I--” Izayuki attempted to break in and protest or further question it. The information was too much for her adrenaline-rushed mind to process. However, the feline interrupted her before she could speak her scattered mind. “And you’ve grown enough in both age and power to no longer require the seal of protection a mother would give to her child. At this point in time, Rika has become more of a burden to you, holding you back from your true potential, rather than she is protecting you. Our memories forge who we are, and she has no right to deny you that,” he stated boldly, beginning to stand up from his crouching position. Without warning, despite an obvious shout of “wait” from the tanuki, Inteus murmured a short, mystical chant under his breath as he held the container of sake in both hands. Once finished, the tiger yokai gingerly opened the bottle, allowing the soul within to be exposed to the free air once more. In close proximity to its counterpart spirit, the two would have no choice but to draw towards one another. It was a cruel process and deed, and upon hearing what sounded like distant shrieks of protest as Rika aimed to use all of her power to resist the pull towards her soul, Inteus closed his eyes and looked away. If only he could shut out his hearing as well. The spirit of his wife was trying her hardest to resist, and to keep her grip on Izayuki’s mind and soul tight. However, the more she tried, the more she would find herself slipping away. The young tanuki girl obviously felt it too, as she held her hands close to her head, as if she had been struck with a massive, incapacitating headache. It was a hard scene to watch for the feline yokai, as the tanuki’s silver tail lashed in several directions from the stress on her mind… and also the creeping of freedom. As soon as Izayuki was free of Rika, he would take the Bakedanuki’s spirit and temporarily seal it in the sake bottle with her soul. After this ordeal, he planned to free her, and face the anger she would likely release. He would need to flee the House of Lost Souls quickly, after his task was complete. After all, there would be nothing to hold back the fury of the long sealed emotions and memories of his daughter. but when it's over, i'm still awake. Another scream rang in the Bakedanuki’s mind moments after she listened to the quiet and mystical chant of the feline in front of her. The story was intriguing and overwhelming, but this left Izayuki confused and incredulous; the fact that it was true. Instantly, she became aware of the presence within her. Was this not the same one whom had helped her control her yokai rage, or gave her soothing words in times of loneliness and strife? Why was she only able to recognize it now. Mother, no! she cried out in her mind. Who would want to lose their mother after just having learned that they were not truly dead, but still around. As her mother’s presence faded, there was something new that began to creep forward. It was almost as if there was something she had lost, and she was only now finding it again. However, it was definitely not something that she wanted to rediscover. Good riddance to those memories, and here they were again. This time, they had the power to haunt her, and that was a fact that struck fear into the heart of the young Bakedanuki. The destruction of the village where she was raised by a group of loving humans hit her with bitterness, guilt, longing, regret, and grief. Her adoption and initiation with Yukionna, followed by the torturous methods the deity chose to use in order to train her brought more fear, anger, and despair into her mind. The techniques that the glacier goddess used were brutal-- locking the child in a dark room with a pack of wolves, generated by the divine ice. She had been forced to fight the summons, and should she revert back to her tanuki form, or another miraculous shape, there would be severe punishment. Should she fail a training, or come close to dying, Yukionna would reappear to painfully freeze her wounds closed, and set her in a place of seclusion for a hefty amount of time. The solitary confinement and physical torture had taken a toll on her mind over the years, along with the acts of defilement delivered and forced on Izayuki. They brought disgust, shame, and a stronger wrath than before-- a deep rooted hunger for revenge, unlike any she had ever experienced before. Reliving the memories began to fuel not only her soul, mind, and emotions, but her instincts as well. The blind Bakedanuki was free of the warmth of her mother’s spirit, and left to the bitter cold of the memories. As the effects of the memories fed her mental state and emotions, so did they to her instincts, the driving force of any beast such as she. Make them stop, please… she pleaded into the nothingness, tears forming on her eyes as she once again could no longer steady herself with her arms. Words failed her; she was unable to use her voice as her mind overruled her body and her control of it. The negativity brought tears to her sightless eyes, while her body was wracked with uncontrollable sobs of utter anguish. Her memories were attacking her all at once, relentlessly, leaving her with a mixed kind of pain she had never known. As the effects began to take hold of her entire being, they started to rip her apart from the inside. A final cry parted from her lips as her physical body and spirit began to mold to the emotions and instincts. Her body was breaking, the outside of it beginning to dissolve, letting go into the chilly thin air. Replacing her form was a liquid-like energy, a shadow material of sorts, that was taking physical mass and growing as her body disappeared. She was letting go; she had no choice. Her instincts were leading her to abandon her mind and feelings, and even her soul and body, as the darkness making up her true identity was no longer sealed away. She was a true monster, having had everything else about her betray her, starting with her memories, mentality, emotions, spirit, body, and even her soul and life itself. What was left but raw instinct? Her transformation was that of a humanoid figure, moving on all fours with claws, topped with an animalian head and long ears, and finishing with a massive column of flowing energy for a tail. A true beast, the one that the Onmyoji likely wanted to see. Her eyes were left as completely white lights, while the body of the monster was no more than a mass of unique, dark, shadowlike energy. Upon transforming, the magical shackle around her neck, placed by the users of Onmyodo, was destroyed, shattering to pieces as if it were a cracker underfoot. With a loud screech, the beast aimed to leap for the highest point in the catacombs. She could detect the scent of the humans above, the ones who had trapped them there. Out of the dark energy body, she began to generate countless needles, all flying towards the ceiling, and easily penetrating the natural earth, as well as the now flimsy barriers placed by the Onmyoji. The underground was starting to cave in around them, but the monster cared less, as it continued to climb as soon as an opening was present. With speed unlike any she had ever possessed before, Izayuki began to fill the area around, even on the other sides of walls, with unholy frost and ice. The scent of death was already rising, which only fed the instincts of the mindless beast, who hungered for blood and revenge. The needles of darkness never once dissipated, and followed their wielder up aboveground, to wreak havoc on the House of Lost Souls. The roof and ceilings had just about caved in from the destruction, leaving ruins and critically wounded littered everywhere. As he spoke, he lunged for the beast, his claws glowing with his own dark energy. Izayuki aimed her own claws for him, though missed while his own speed trumped hers. With the wound delivered in the chest and abdomen, the monster of darkness began to lose power, crumpling down to the ground upon realizing the impact. Ever so slowly, the shadow aura started to take on a more human shape again, save for the ears and tail. However, it began to diminish into a smaller, more docile form as the energy molded and reverted. Within seconds, the only creature left lying on the ground was not a dark monster, but a tiny, silver-furred raccoon dog, half conscious. The spirit quietly nodded, eyeing the silver tanuki longingly. Though, as it had promised, she began to follow the other yokai without another word, finally at peace; a rare thing for a yuurei. There was no need to drag her out of the area. She had already cursed the land, and an attack on a vulnerable her would be a terrible mistake. Time passed, a few minutes, or perhaps several long moments, unestimated. She had an array of objects scattered around her, or messily worn on her. A crystal necklace, a magical amulet, a pink scarf. At her side was a leaf, in perfect condition, a paper fan that was folded and sealed, a wedding ring, a toothpick, and a spork. The items she wore were a disguised weapon, the house of a half-Daemonic spirit, and a beloved and comfy garment. As for the items, all were important to her, though would simply disappear to be summoned elsewhere, should she move too far away. However, something else had the fallen canine’s attention. Aiyana was, for once, at home. She was quite alone at the time, Mao having other things she needed to do that left her away for a few days, and was simply laying in the large king-sized bed that had pillows galore on it. The nine tailed fox celestial spirit had gotten used to the dual worlds of living, and found that her time outside of the celestial realm had gone up tenfold before she needed to leave for a little while to recover. The few weeks she had been back in Lamia Scale had been interesting. Mao had come with her, as had the rest of the survivors of her race, to join their original guild so that they had a familiar place to live in. It had been a struggle at first, coping with the loss of an entire guild and the members being scattered, but now that she was slowly getting out of that depression by going on jobs and crying into pillows she was feeling much better. A look over her right shoulder would allow her to see the plaque on the wall that told those that looked at it that she was a now a Wizard Saint, number six of ten in the group even though there were only four people with the title currently. Two were people she knew well, the other was someone she had only met once to make a contract after Elyx had gifted the guild master of Black Rose her key. The contract had been simple; Do not be a dark mage, and since Aiyana can suppress being summoned she will only appear when she is not in the middle of something important such as a job of her own. Snuggling her own tails, which were currently in pristine condition as she had done nothing but stay home to groom and relax, the woman was almost to the point of sleep when she heard a small voice in the back of her head. 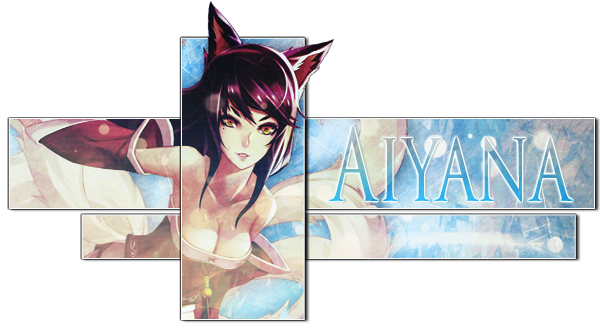 A noise from behind her, the shuffling of rubble a few meters away, would cause Aiyana to turn in time to see a strange being that seemed to be made of paper begin charging at the location The nine tailed fox and the tanuki were at. Are you after me, or the cute one? Wait...those are both me... WELL! Either way I can't just let you terrorize people like you are trying to!” Aiyana would teleport to where the creature was and let loose a burst of frostfire that charred and froze the paper being at the edges before it swung at her. A deft movement would allow Aiyana to dodge as the aura she gave off began to burn more and more of the paper monster before she finally drew her weapon and struck through the center of it with a hard swing. The sound of tearing paper could be heard even as a blast of solar energy rained down around the celestial spirit as her cosmic slayer magic crisped the thing completely. The smoldering paper rained around as she looked back at the tanuki to realize it was still out like a light in a basement full of a crazy man's loli collection. With the strange monster turned into confetti, hands would gently pet the shown side of the poor thing before she gently lifted the small being and made her way back to her home in Hargeon Town. It would only be a couple hours later that the silver tanuki was bundled up in blankets, a mound of soft pillows surrounding it as it lay upon a few. She had cast a healing spell on the poor thing, but that would not bring back the mind of the creature so that it could wake up and, hopefully, rest before deciding that this fox woman was nice enough to let her adopt the thing. The last thing she wanted was for this creature to wake up and tear up the place. It was not a cheap house that she had. When you did so many risky jobs like Aiyana had you took some of the better pleasures in life when you got the chance. An expensive house, tons of stuff inside to furnish it, a very full kitchen and liqueur cabinet, and even some of the interesting art she had found at times. A bowl of fresh fruit lay on the bed, as well as some bits of various nuts and jerky so that the poor thing could eat once it awoke. The pillows and sheets could be washed afterword, that was not an issue, so long as this little girl woke up and was okay.